And the Answer is . . . Al-Musawwir! Understand Al-Qur'an Academy > 99 Names of Allah - Asma ul Husna > And the Answer is . . . Al-Musawwir! Allah calls Himself Al-Musawwir— The Fashioner, The Bestower of Forms— on one occasion in the Quran. He is the One who forms and shapes all that exists. Al-Musawwir gave everything its own distinct shape and inclination or desire – despite the great variety of the creation – every single creature is unique! Musawwir comes from the root saad-waw-raa, which points to three main meanings. The first main meaning is to make something incline, lean, or bend, and the second is to form, fashion, sculpt, imagine, or picture something. The third main meaning is to have an inclination or desire towards something. This root appears 19 times in the Quran in five derived forms. Examples of these forms are wasawwarakum (“and He formed you”), as-soori (“the trumpet”), and sooratin (“form”). Linguistically, khaaliq, baari’, and musawwir are interrelated in meaning and deal with the aspects of Allah ‘azza wa jall as Creator; all the rest is creation. Al-Musawwir bestows forms and not by way of copying— He is far above that. Al-Musawwir says Be! and it is, with the attributes and the form that He has chosen for it. He does what He wills and creates what He wills in the form that He wills. In Surah al-Hashr, Al-Musawwir’ is mentioned after al-Khaaliq (The Creator, The Maker) and al-Baari’ (The Originator). Some scholars have said that in this ayah the attribute of creation refers specifically to Allah’s determination of what He creates, so it comes first. The name Al-Baarī’ refers to the creative act of bringing about what Allah wills to create. 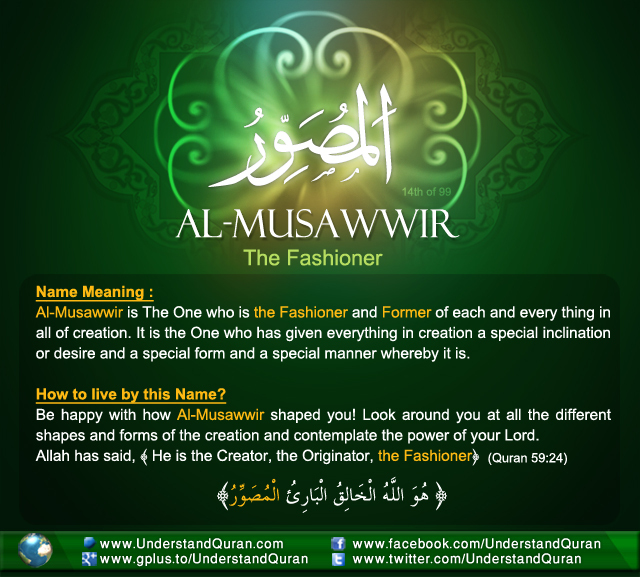 Finally, the name Al-Musawwir (the Fashioner) refers to giving each created thing its particular form. So Allah decrees what He creates, brings it into existence, and specifies its particular, unique form. Scholars also have differentiated between these three names as follows: Al-Khaaliq is the One Who created from nothing all creatures that exist, according to their decreed qualities. Al-Baari’ is the One Who made man from al-baraa, i.e., clay. Al-Musawwir is the One Who creates various forms and shapes. So al-Khaaliq is a general word, al-Baari’ is more specific and al-Musawwir is even more specific [Kitaab Sharh Asmaa’ Allaah ta’aala al-Husnaa, Dr. Hissah al-Sagheer]. 1. Be happy with how al-Musawwir shaped you. We live in a time of cosmetic surgery; if you don’t like how you look, you can change yourself with a medical procedure. Allah ‘azza wa jall says: He it is who shapes you in the wombs as He pleases. There is no god but He, the Mighty, the Wise. [Quran, 3:6] Be content with how Al-Musawwir shaped you by His ultimate wisdom. For example, if we were as beautiful as the Prophet Yuusuf ‘alayhi salam, would we be able to withstand the temptations he faced? When you look at yourself in the mirror, say Alhamdulillah. If Shaytan tempts you to complain about any of your facial or body features, remember those who are blind, sick, or disabled. 2. Reflect on beautiful shapes. Allah ‘azza wajal says: Then We made the seed a clot, then We made the clot a lump of flesh, then We made (in) the lump of flesh bones, then We clothed the bones with flesh, then We caused it to grow into another creation, so blessed be Allah, the best of the creators. [Quran, 23:14] Everything you see around us is proof of Allah’s existence. To please your senses, He designed flowers, trees, fruits, and even cows and sheep, etc. to have very appealing shapes. Amazingly, when it comes to outside your range of normal vision, the mosquitoes, bees, and other insects are very terrifying to look at. He ensured that you live a pleasant life, so thank Al-Musawwir for the blessings of beautiful shapes to look at. 3. Live up to your potential! Know your position. Indeed, We have created the human being upon the best of forms. [Quran, 95: 4] Al-Musawwir created and formed you with a particular brain, heart, face, and limbs, which differentiate us from the animals. How do you use them? You will be questioned on the Day of Judgment as to how you use your hearing, your sight, and your hearts. So use these faculties to do as many good deeds as you can and don’t use them to harm yourself or others by sinning, nor by going to forbidden places. Allah ‘azza wa jall alone deserves your worship. This is the Creation of Allah. Now show me that which those (you worship) beside Him have created. Nay, but the wrong-doers are in manifest error! [Quran, 31:11] Remember this ayah when you feel tempted to turn to others for your desires instead of to Al-Musawwir. Is not He Who created the heavens and the earth able to create the like of them? Yes Indeed! and He is the Superb Creator (of all), the Ever-Knowing. Surely His Command, when He wills a thing, is only to say to it: ‘Be!’ and it is! Therefore glory be to Him in Whose hand is the Kingdom of all things, and to Him you shall be brought back. [Quran, 36:82-83]. Al-Musawwir perfected everything you see around you; don’t you think He can solve all your problems? So remember when you supplicate: nothing is impossible for al-Musawwir. O Allah, Al-Musawwir, we know that You are the One who forms the whole creation. Make us of the shaakireen (the grateful ones) for our own forms and the shapes around us, help us ponder Your creations and ask You at all times. Make us of those who use the blessings you gave us for good, and make us witness the beautiful shapes of Paradise, ameen! PS: Did you already sign up for our newsletter? Sign up now and receive the free welcome gift to the series The Names of Allah! And the Answer is . . . AL-HAKAM! fauza April 10, 2013	Log in to reply.